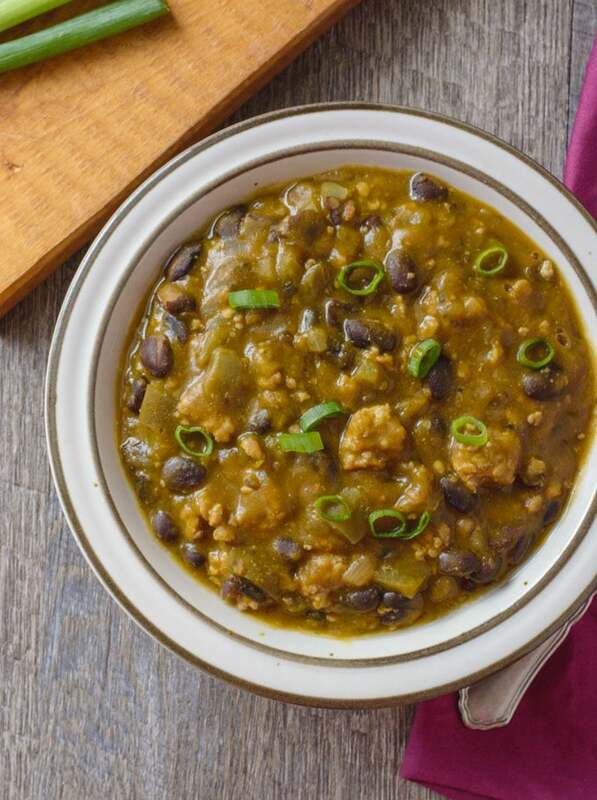 This Turkey Pumpkin Chili is the perfect Fall dinner recipe made with ground turkey, black beans, canned pumpkin and tomatillo salsa. 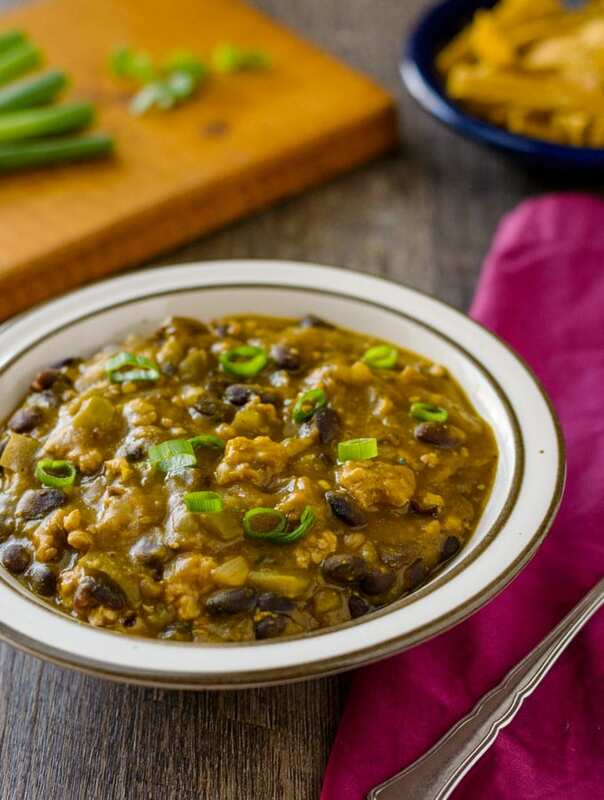 It’s a healthy chili recipe that’s hearty and delicious! It’s the perfect time of year to make a big pot of chili, and I have quite a few favorite recipes like my Chili con Carne and Easy Vegetarian Chili. But nothing says Fall quite like a turkey chili with pumpkin! The pumpkin puree creates a thick and creamy base, and the roasted tomatillo salsa adds a ton of flavor with very little effort! This can be on your dinner table in less than 45 minutes, so it makes an easy weeknight meal. Make my salsa recipe ahead of time, or get a good quality store-bought one that has your preferred heat level to use in this chili. I recommend the Frontera brand if you like a medium heat level. Serve this with your favorite chili toppings. I like to top mine off with sour cream, sliced green onions, and some fried tortilla strips. Omit the black beans. Bump up the protein with additional ground turkey or chicken. Substitute zucchini in place of the beans. Check the food labels on the chicken stock to ensure the chicken stock is paleo friendly or use bone broth. Or make your own homemade stock or bone broth. Omit the sour cream, cheese, and tortilla chips garnishes. You can make this pumpkin chili recipe with ground turkey or ground chicken. If you don’t like black beans, you can substitute pinto beans, kidney beans or white beans. If the chili is looking a little thick as it cooks or you prefer a chili with a thinner consistency, you can add additional chicken stock or water. 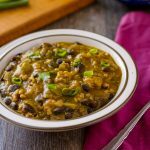 This Turkey Pumpkin Chili is the perfect Fall dinner recipe made with ground turkey, black beans, canned pumpkin and tomatillo salsa. Heat the oil in a 4-quart dutch oven or soup pot over medium-high heat. Add the onion and Anaheim pepper and cook, stirring occasionally, until the vegetables are tender, about 5-6 minutes. Add the ground turkey. As it cooks, break up the meat with a spatula or large spoon and continue cooking until no longer pink, about 6 minutes. Stir in the ground cumin and cook for about a minute. Add the pumpkin puree, salsa and chicken stock to the pot and stir until well combined. Then, gently stir in the black beans. Reduce heat and let simmer for 20 minutes. Add salt to taste. Serve with your favorite chili toppings like sour cream, cheese, tortilla chips, fresh cilantro or sliced green onions. If you don't like black beans, you can substitute pinto beans, kidney beans or white beans.